I always want to be honest with you. And honestly...this was a risk. I knew it was, too. It was the end of the month, and you know how that goes. That's the time that you scour the pantry and try to find something convincing and filling. Will I make this for anniversary meal? Probably not. But on those days when you only have a few canned goods and a pound of ground beef, this is your meal. It's good. Promise. I don't eat things that are bad. Neither does Tim. While that's boiling, cook ground beef over medium high heat, chopping finely. Once cooked, drain and return to pan and turn heat on low. Add 1 teaspoon of minced garlic and stir. Add a pinch of basil, oregano and garlic powder. Dice up cream cheese into small cubes and add to ground beef mixture. This makes the mixture nice and creamy. If you don't have cream cheese, add 1/4 cup milk instead. It's not exactly the same, but it still makes the same bottom line. Remember, the longer it simmers, the better it tastes! Drain noodles and return to pot. Add the ground beef mixture to the pot o' noodles and stir. Add drained corn and beans and mix thoroughly. Transfer to a 13x9 pan. Top with all the shredded cheese. Bake at 350 degrees for about 15-20 minutes or until cheese is melted and bubbly. Serve with fresh bread and salad. Feel free to add any other ingredients if you feel so inclined. 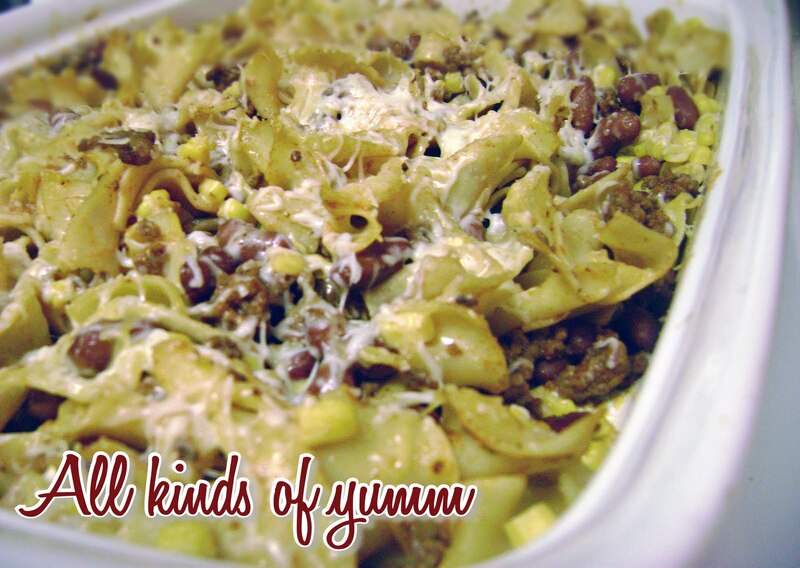 Like this blog, this recipe doesn't discriminate. Isn't the whole point of hamburger helper to eat things you would have otherwise forgotten were even in your pantry?